RTE Brainstorm Article – What’s the impact of vaginismus on Irish relationships? RTE Brainstorm have published an article on the DCU Study of Vaginismus in Ireland focusing on how relationships are affected. The inability to have a sexual relationship has a profound impact on how the woman feels about herself, on her partner and on their relationship. 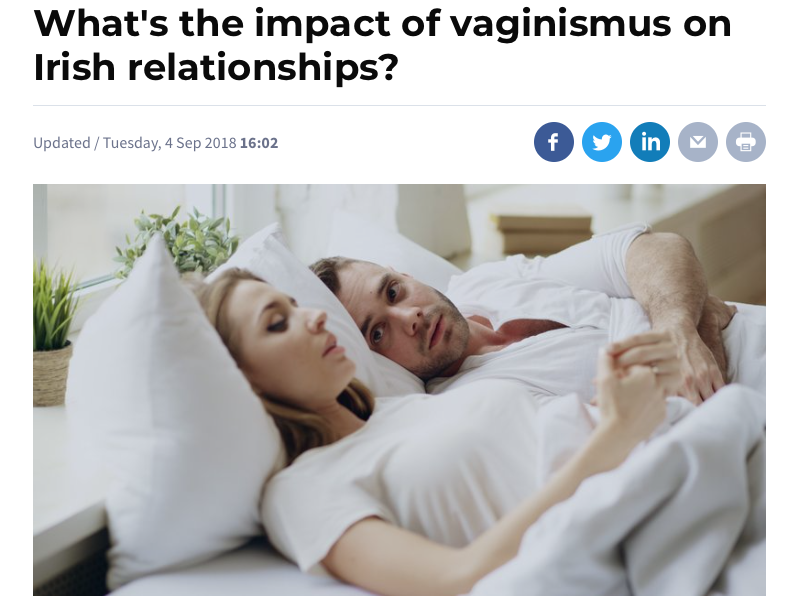 What's the impact of vaginismus on Irish relationships? The current DCU study, which is being carried out in conjunction with Dr. Rosaleen McElvaney and Dr. Rita Glover, is seeking to start a conversation about vaginismus in Ireland. Maria McEvoy is currently looking to interview couples who have experienced vaginismus. The study has been approved by the DCU Ethics Committee and all information will be held in the strictest confidence and all identifying information will be completely removed. The Dublin City University study of vaginismus in Ireland, lead by researcher Maria McEvoy, was reviewed by journalist Dee O’Keefe for the Herald Health Supplement on 29th August 2018. This is the first known study in thirty years on the island of Ireland about vaginismus. Vaginismus affects the lives of many women and couples and yet very little information is available about vaginismus. This article contains information about vaginismus, the DCU study and how to get involved in the conversation. Full text of the Herald’s feature “We Need to Talk About Vaginismus” is available by clicking the button below. The DCU Study of Vaginismus is featured in an article in the current HSE Sexual Health News Issue 6. This free magazine can be found in a wide range of clinical and allied health services as well as youth, community and education services in Ireland.